James O’Keefe, founder of Project Veritas, said his undercover videos and audio recordings are supposed to report stories the mainstream media won’t. About 60 people came to College Republicans’ winter speaker event on Wednesday. There is an increased need for independent citizen journalists in the “post-factual” world, activist James O’Keefe said in a talk hosted by College Republicans Wednesday. 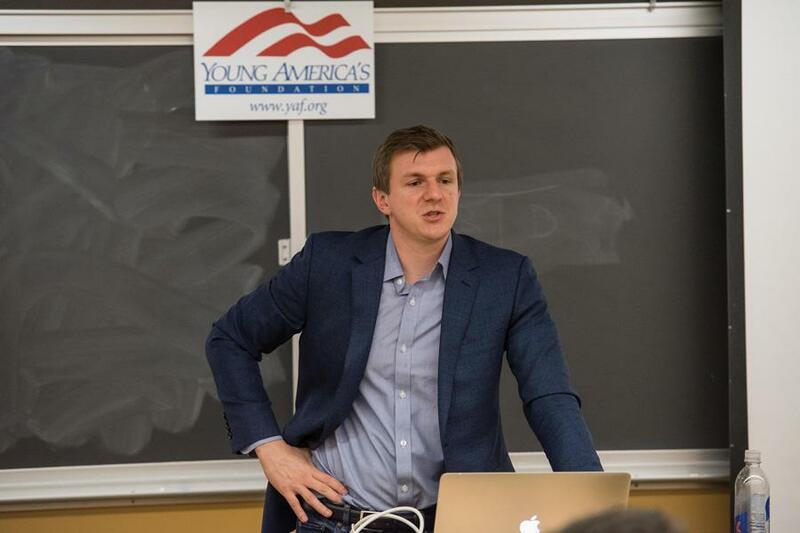 O’Keefe, College Republicans’ winter speaker, said he launched the website Project Veritas to conduct undercover investigations into potential corruption and injustice in government officials and institutions. Commentators have criticized O’Keefe’s videos for Project Veritas as being deceptively edited and for reporting tactics such as using false identities to gain access. He said after investigations, the coverage by mainstream media outlets helps promote his site and ultimately elicit a reaction from the targeted institution. O’Keefe detailed a 2009 scandal surrounding the now-defunct Association of Community Organizations for Reform Now, a publicly-funded organization that advocated for affordable housing. O’Keefe said he went undercover with conservative activist Hannah Giles to reveal employees’ possible knowledge of criminal activity by inquiring how to use affordable housing for prostitution. Clark Hoyt, public editor of The New York Times, wrote in 2010 the videos of different offices nationwide were “heavily edited” to make ACORN employees appear in the worst light. But O’Keefe said his video helped defund ACORN and pointed out that the scandal also lost the organization many private donors. One of the video’s subjects later sued O’Keefe, claiming an invasion of privacy in the filming, according to The Washington Post. O’Keefe settled the case for $100,000, the Post reported. “This is an American story about how a citizen, how normal people with nothing but YouTube can get their stories to the White House and the only thing that matters, the only thing that you need, is the willingness to not be afraid,” O’Keefe said about his videos on prominent Democrats Scott Foval and Robert Creamer. The leaked videos appeared to show Creamer, a political consultant who is also the husband of U.S. Rep. Jan Schakowsky (D-Evanston), talking about voter fraud. They also show Foval, former national field director for Americans United for Change, discussing hiring homeless and “mentally ill” individuals to protest at Donald Trump rallies. Foval was laid off from Americans United for Change, and Creamer said last October he was “stepping back” from working for the presidential campaign. When he investigates a controversial topic like abortion, O’Keefe said he doesn’t want to argue its morality or legality but instead aims to find aspects of Planned Parenthood that he thinks are indisputably wrong. Before O’Keefe spoke, Evanston residents Susan Laws and Michael Orenstein stood outside the event with a sign supporting Planned Parenthood and did not listen to his talk. Julia Cohen, vice president of College Republicans, said the two people standing outside the event were “perfectly respectful” and had the right to be there because they did not block the entrance or disrupt the event. The SESP senior said the event was successful despite pushback the group received for inviting O’Keefe.